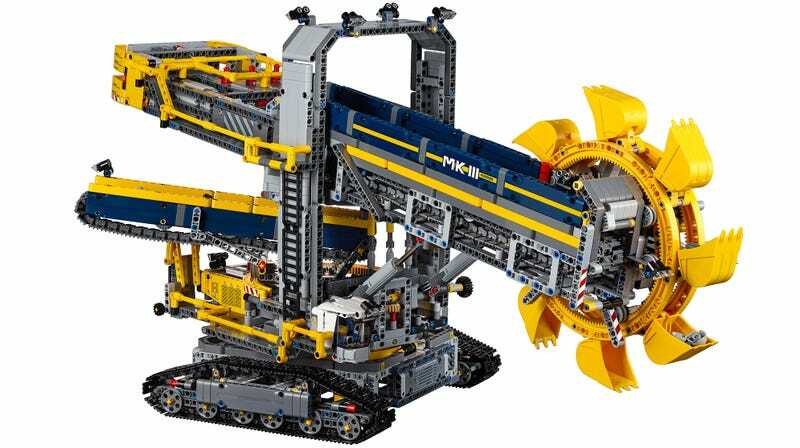 We got a sneak preview of Lego’s new Bucket Wheel Excavator at the Nuremberg toy fair earlier this year, but now we have official details on the monstrous set, which will come with over 3,900 pieces, officially making it the largest Lego Technic set to date. Available starting August 1, the excavator stands a mighty 16-inches tall and 28-inches long with its rotating bucket wheel fully extended. It lumbers along on working tank treads, and includes countless moving features including conveyor belts that carry debris away (or unneeded Lego) and a rotating superstructure. Pricing details haven’t been revealed yet, but you can expect the new set to come at a premium given Lego’s 2,704-piece Technic Porsche 911 GT3 RS will set you back $300. But for added value, the Bucket Wheel Excavator includes a motor to power all of its functional features, as well as a properly scaled steerable dump truck for your make-believe construction site. Is that still not enough to have you reaching for your credit card? The set also has alternate building instructions to turn the excavator into a slightly-less-exciting Mobile Aggregate Processing Plant. But with Lego half the fun is the building process, and both of these models should keep you busy for at least a few weeks.